Hungry for a delicious culinary adventure through Vietnam? Good. Because this recipe is about to take your taste buds on the Southeast Asian vacation you’ve been craving. These Vietnamese spring rolls are so fresh, vibrant, and flavorful that you’ll actually feel like you’ve been transported to Vietnam — maybe to the colorful, chaotic streets of Hanoi, or onto a small fishing boat, floating atop the emerald waters of Ha Long Bay. Either way, though, this is happening! In case you need a few reasons to turn your kitchen into a Vietnamese street food stall — at least for the day — I have plenty. And they’re also delicious. Can I reiterate that point? These Vietnamese spring rolls are delicious. If I’ve convinced you, and you’re all ready to take a little culinary journey with me, then let’s get started. See? These are all items you probably have on hand right this second. To prep for these Vietnamese spring rolls, start by boiling a pot of water to cook your bean thread noodles. I love these bean thread noodles, whose instructions say to boil the water, turn off the heat, throw in the noodles, and let them stand for about twenty minutes. If you have a different kind of noodles, simply follow the package’s instructions. Meanwhile, the next step is to julienne your carrots, red bell peppers, cucumbers, and green onions. Then remove the stems from your cilantro and mint, and roughly chop them. 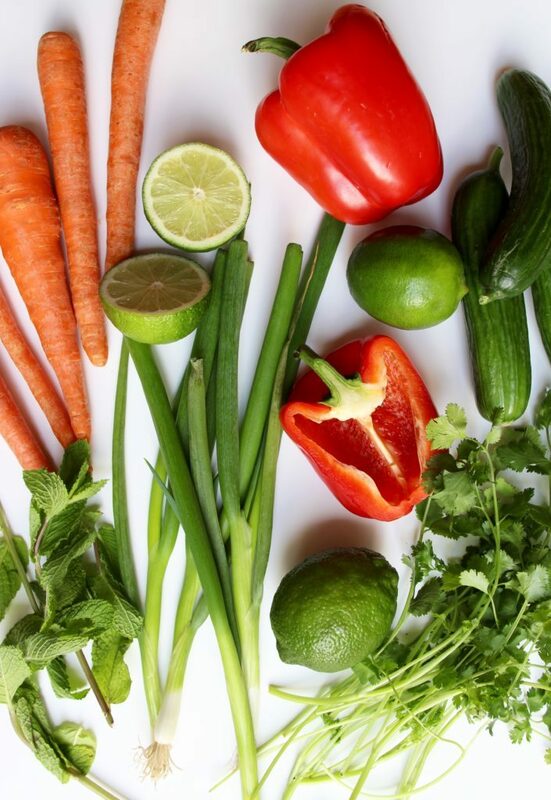 In a bowl, mix up your lime juice, rice vinegar, sugar, and salt, and then toss in your carrots, red bell peppers, cucumbers, and green onions to give them a nice, fresh coating. I like to do this step in portions, to make sure my different vegetables stay separate, but you can just throw them all in at once, if you really want to. In another bowl, toss your bean thread noodles together with a dash of some sesame oil, soy sauce, and red chili flakes. Once you’ve prepped your spring roll filling, it’s time to make your peanut sauce. And this step couldn’t be easier! Simply add your peanut butter, soy sauce, lime juice, sriracha, sugar, and hot water into a bowl, and whisk it until it’s smooth and creamy! And that’s it for prep. Let’s get to rolling these babies up, shall we? Once you’ve prepped your noodles, vegetables, and herbs, it’s time to roll your spring rolls. To soften your spring roll wrappers, fill a shallow, round bowl or pie plate full of warm water. One by one, put a spring roll wrapper into the warm water. Make sure it’s submerged, gently flip it over, wait a few moments (just until it’s pliable), then remove it. Next, lay your softened spring roll wrapper flat onto your wrapping surface, place your vegetables, herbs, and noodles onto the wrapper, and roll it up like a burrito! This video includes a quick wrapping tutorial. 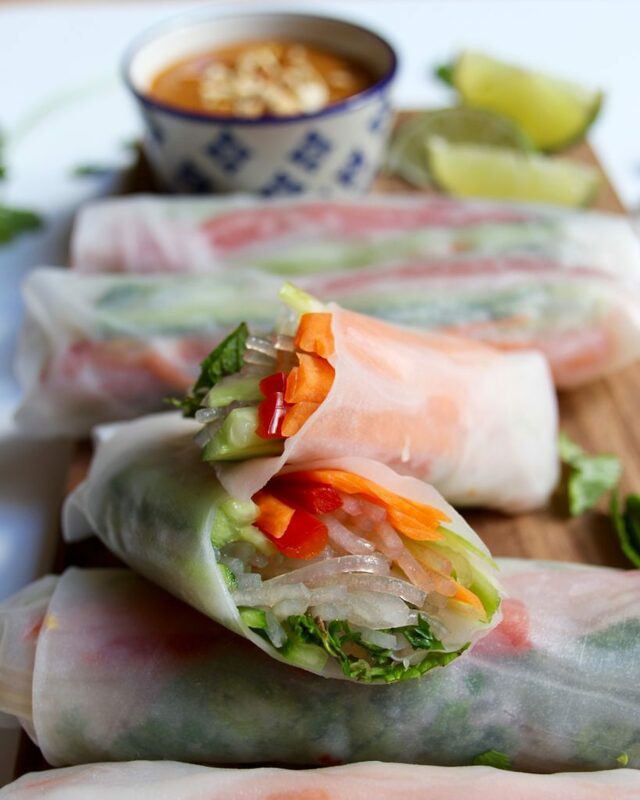 Then repeat until your spring rolls are all wrapped up! It’s finally time to devour your rolls. And since they’re oh, so healthy, you don’t need to feel guilty if you accidentally eat seven of them. If you want to, cut ’em in half or eat ’em whole. It doesn’t matter. Just make sure to dip them in that delicious spicy peanut sauce. And if for some reason, you don’t eat your spring rolls in one sitting, you can store them in the fridge for a day or two, wrapped in a slightly damp paper towel. Though, I’ll be honest, these Vietnamese spring rolls taste best when eaten fresh — and shared with friends and family! Now, I don’t know for sure. But my guess is that leftovers won’t be thing that happens when you make these beautiful Vietnamese spring rolls. After making these Vietnamese spring rolls for the first time, I was hooked. These rolls are now one of my favorite things to eat. And I have a feeling you’ll feel the same after you make them. 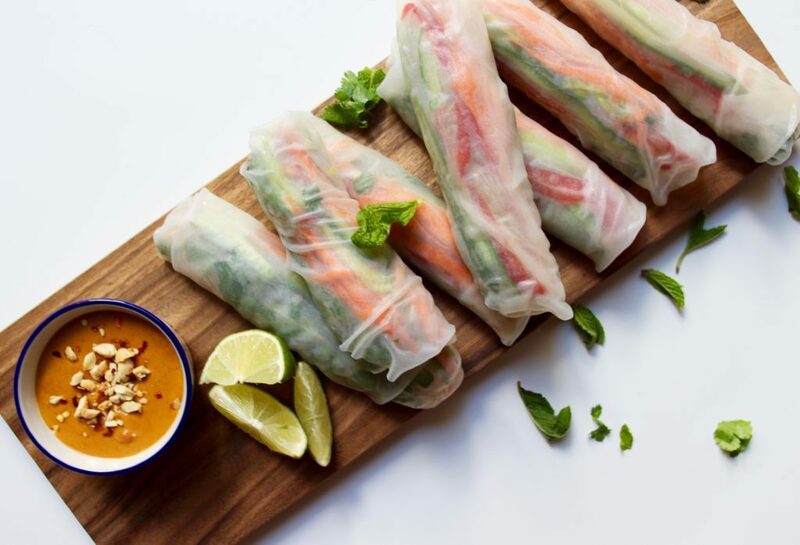 The combination of fresh, vibrant veggies, zingy herbs, and noodles, wrapped up into one beautiful little parcel, and dipped into creamy, spicy peanut sauce cannot be beat. It’s as simple as that. But this? This is definitely the next best thing. 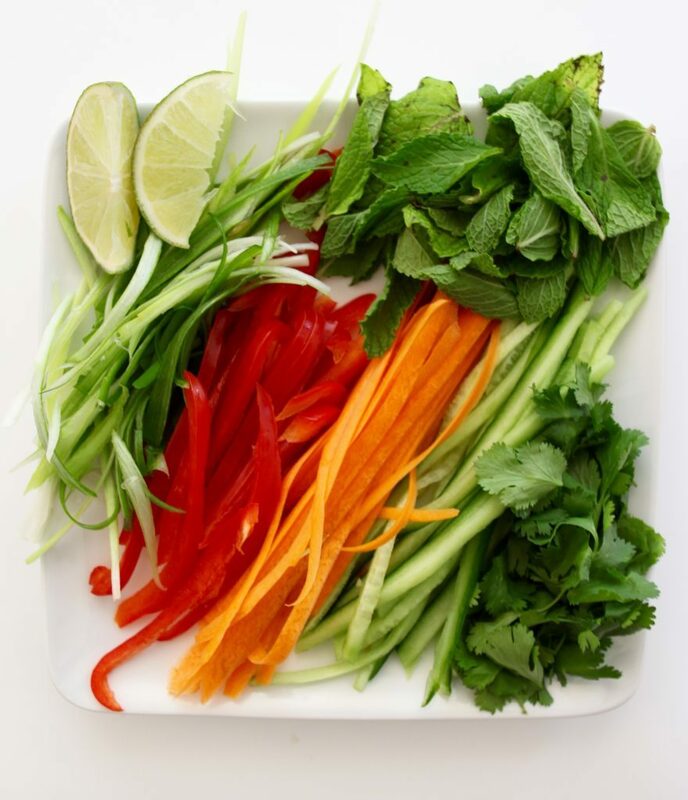 Looking for an easy and healthy, yet super satisfying Vietnamese spring rolls recipe? These vegan, gluten-free rolls are packed with fresh vegetables, flavorful herbs, noodles, and lots of beautiful, bright colors. And they're complete with a deliciously spicy peanut dipping sauce! Cook the bead thread noodles according to the instructions on the packaging. Strain the noodles. Then, in a bowl, mix your bean thread noodles with the sesame oil, soy sauce, and red chili flakes. Julienne the carrots, red bell peppers, cucumbers, and green onions. Remove the stems from the mint and cilantro. Roughly chop. In another bowl, mix rice vinegar, lime juice, sugar, salt. Coat the carrots, red bell peppers, cucumbers, and green onions, with this mixture. Be careful to keep each of the different vegetable piles separate. Whisk together peanut butter, soy sauce, lime juice, sugar, sriracha, and hot water until smooth and creamy. Take your prepped noodles, vegetables, and herbs and organize your rolling area. Fill a shallow bowl or pie pan with warm water. Put a spring roll wrapper into the warm water. Make sure it's submerged, gently flip it over, wait a few moments (just until it's pliable), then remove it. Place your wrapper onto a clean, flat surface. Place small portions of the vegetables, herbs, and noodles, onto the wrapper. Then, roll the wrapper up like a burrito. Repeat the wrapping process, one by one, until complete. 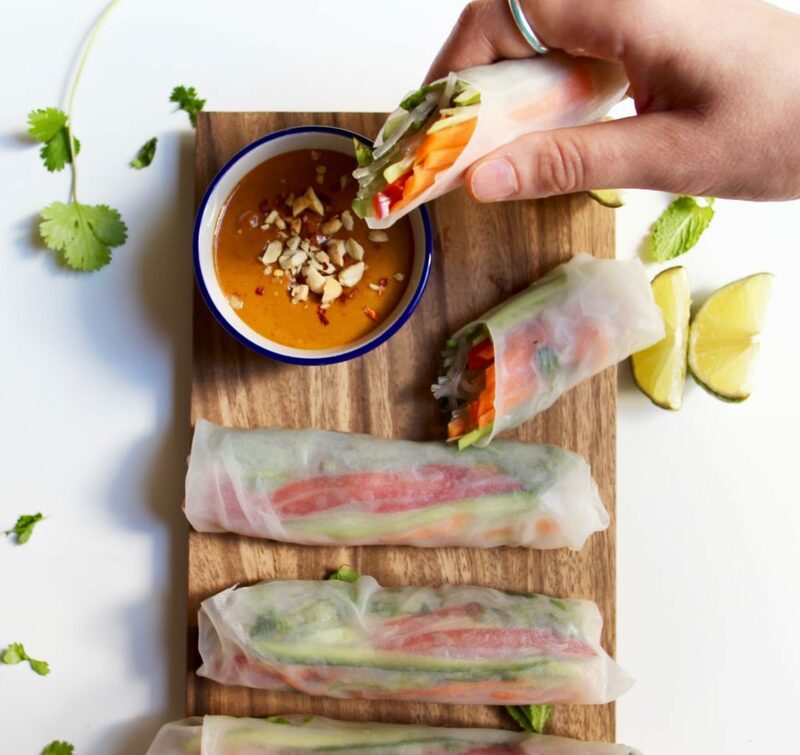 Did you try out our recipe for Vietnamese spring rolls with spicy peanut sauce? If so, let us know how they turned out in the comments below, or tag @travelalphas in your photos! I love fresh spring rolls but I have a hard time making them. LOL I always put too much filling into them I think. I guess I do not like Vietnam foods. Seems to be very delicious! Thanks for shaing, Maddy. These look delicious! 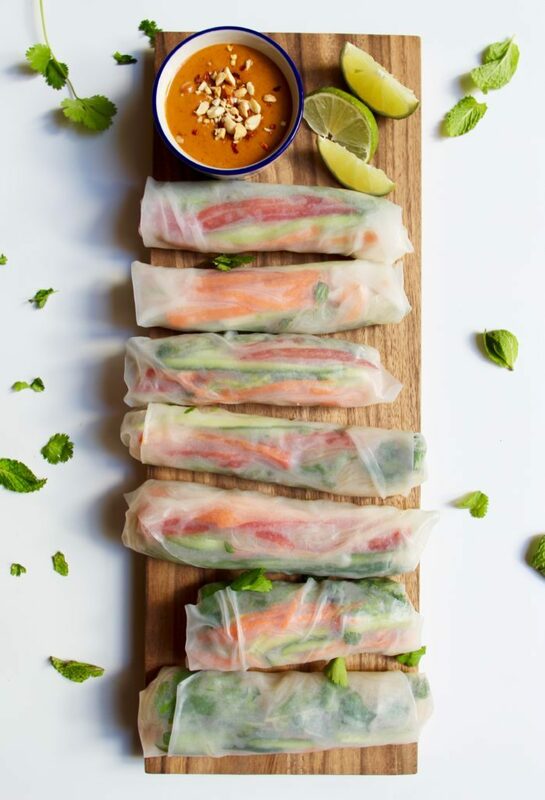 I love Vietnamese spring rolls but have never tried making them myself, I will have to give your recipe a try!